Hi Friends. Hope your Wednesday went well. We did some major grocery shopping today. We both hate it, so we only go about once a month, picking up milk, fruit and fresh vegetables in between. Puppy is recovering from being Spayed on Monday morning. She actually is really active and you wouldn't even know she had surgery, except for the cone she is wearing on her neck so she cant pick at the stitches before she is healed. Ten days is a long time to wear this thing and she hates it. Could this face be any sadder. She is much better today (day 3) and a lot more active. But she is running into everything like a bull in a china shop. Three days down, 7 to go! 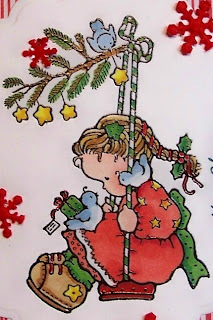 Today's card is for the challenge at Penny Black and Friends Saturday Challenge. 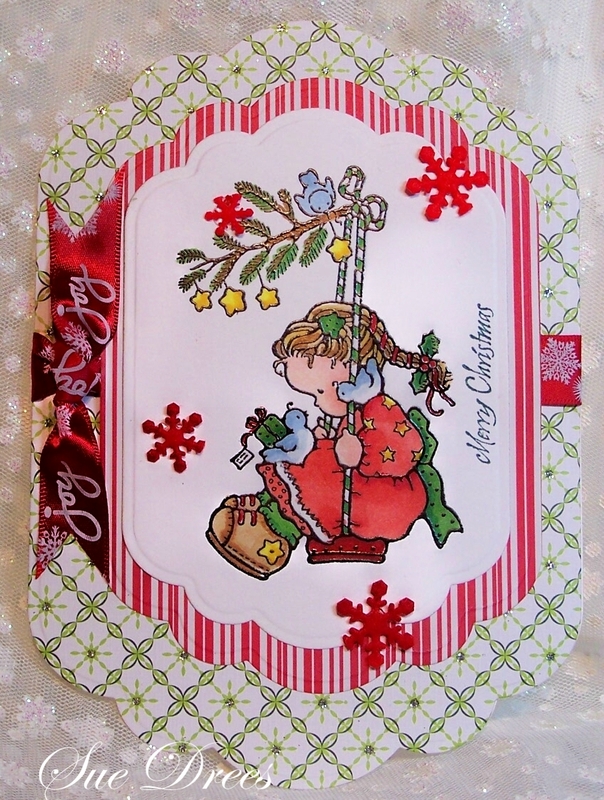 It's their November challenge and the theme is "Cute Christmas"
Christmas papers from my Stash from last year. Awwwww your puppy looks adorable! She probably can't understand why she has a big cone on her head! I wish the best for your girl! 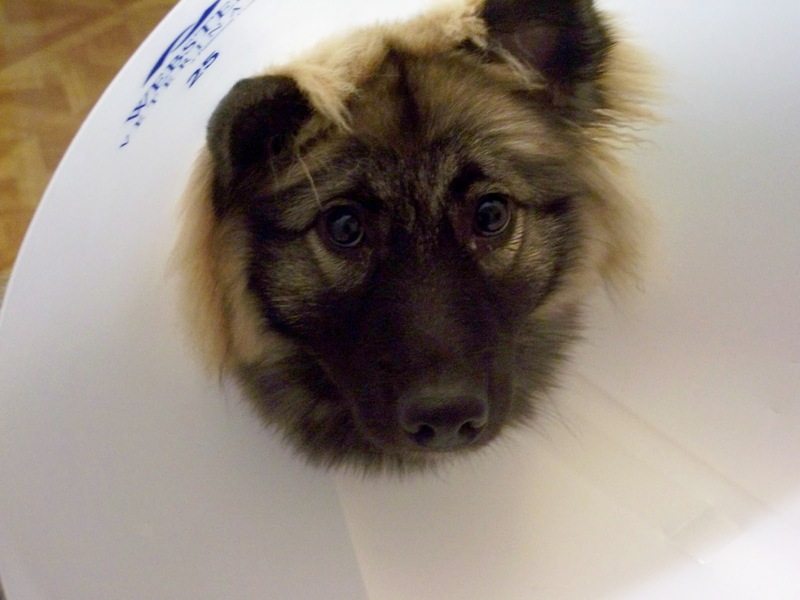 It always cracks me up when they call it the cone of shame. Guess that is b/c most of the time, they eat a sock or something and have to have it surgically removed. LOL! Hope she is feeling well. Sweet card, Sue! Your card is super cute and I love that shape. What a darling little image and so nicely colored. I wanted to play along, but I haven't had a minute to work on cards for days now. I need to switch my priorities around. The heck with rearranging my cupboards. Keeya looks so adorable and sad at the same time. Oh tell him Auntie Donna send kisses and than 7 isn't really that long. I know he won't agree but he'll have no choice. Have a great week ahead. We have about 4 inches of snow on the ground this morning and the wind is blowing quite hard. Perhaps your pup wouldn't look so sad if you blinged up that lamp shade a bit. I love the stamp you used for this challenge. It is a lovely card. Yes dogs certainly hate the cone and one always feels so sorry for them even when you know it is all for the best! Love the card Sue, great shape, the image is just so sweet and you coloured her wonderfully! Love it! Adorable card Sue...I love the image! Poor puppy looks so sad but really quite adorable! Love your sweet puppy! Cute! Your card is wonderful and I love the sweet image. Poor baby time is almost up! When we had Bonnie spayed she figured out how to get out of the cone and pulled her own stitches out twice. Vet never saw such a toughie and she was only around 7 pounds. Love the bright colors in this one Sue. I bet it was fun to color.